The use of android smart phones is plethora nowadays. And due how android smartphones is widely used by almost everyone, the limitation of theft has been raised. Anti-theft Apps for Android smartphones are android apps that prevents and track down unauthorized persons from using or harming your android device. It also helps in tracking down your stolen android smart phone easily. The Anti-theft software are really great and most android users that have tested some of the anti-theft apps can testify about it. In our previous tutorial, I published an article about “the top 5 Android Antivirus App” which is quite helpful. Most antivirus app can also serve as an anti-theft software on our android device, but in today's stroll, I would brief you guys on the top 5 Android anti-theft app for android smartphones. And the apps I would be explaining below has a unique functionality, that that is the “Anti-theft”. Below explains the top 5 android anti-theft app to use in 2015. Dandum Anti-theft App is one of the most efficient android anti-theft app with loads of exclusive features. One great thing about dandum is that, all the premium features it acquires is free of charge. By just sending an sms from other mobile, dandum app would easily track down your mobile if lost or stolen. In other words, dandum helps you in terms of anti-lost solution and also anti-theft solution as well. · It also remotely wipe your android device. (This is a great feature, and it favors individuals that has private documents on there device). · It also helps to get the image or photo of the theft/robber if the Sim of the device is changed. · It also helps you track down the SSID of the new Sim to backup no. So quickly download “Dumdum app”from your Google playstore and activate it within 60 seconds. This is another great android anti-theft app in 2014. Using this app helps you to protect your device against theft. Below are some brief features about “Where's My Droid” anti-theft app. · It can easily track your android device by making it ring/vibrate. · It doesn't drain the battery of your device. · Tracks down the theft by taking pictures secretly. · It helps to remotely wipe the phone data of the android device. · It also avoid the theft from uninstalling your android apps. · It also keeps the Where's My Droid app icon hidden and many more great features. You can also download Where's My Droid app from your Google playstore or market. Even the name of the app reveals the app functionality. Android Lost is a great anti-theft android app that highly prevents your android device from unauthorized persons or helps to track down your device if stolen or lost. · It reads the sent and received messages. · It helps to take secret pictures of the theft with both the front and rear camera and many more features. I recommend you also make use of the “Android Lost” app, because it's quite helpful. You can simply download the app from your android playstore or market. Antidroidtheft is a very valuable android app that prevents you from theft. 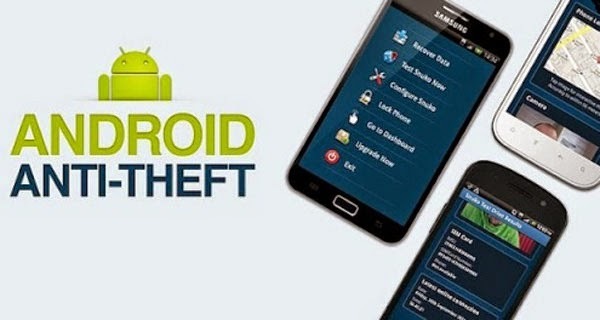 With antidroidtheft, you have added extra security to your android device if stolen. Some major features of androidtheft is to help you track down your android device using GPS, it also helps you track changes of Sim cards or Phone numbers and also view pictures taken from camera, Spy camera. Antidroidtheft is one of the oldest android anti-theft app that have been on existence since 2010 and it's till recommended till date. The developers of this app is doing a great job by upgrading the features of this app often. I also recommend this android anti-theft app for android users, because it's functions and interface is really impressive. You can simply download the app from your android playstore or market. Cerberus App is known as a complete anti-theft application. With this app, you can easily recover your stolen or misplaced android device. This app is regarded as one of the best android anti-theft software, and the trial version of the app lasts for one week, which after you would be given a life time license to use the app for just £2.99. · It also helps to run a SIM check, that is, if someone uses an unauthorized sim card on your android device. · It also remotely wipe both phone memory and SD card. · It also helps you track down the network the device operator is connected to and many more features. You can download Cerberus Anti-theft app from your android play-store or market. Hope the above apps helps. If you find the article interesting, simply like our Facebook page via here and also follow us on twitter via here. To receive our future updates, you can simply subscribe as our email reader via here. It's free and you would receive loads of our future updates directly into your email box. Thanks to share Gauri, i used Total recall recording app. Its really great application. Thanku so much.! !